(As with all Readers’ Guide Questions, it is strongly suggested you not read these until you’ve read the story.)1. Have you ever welcomed guests (family or otherwise) into your home and regretted it? Describe the situation. Did the incident change your reaction to further guests? Do you believe you are a good houseguest? 2. 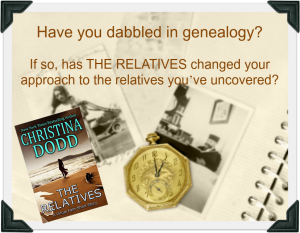 Have you dabbled in genealogy? If so, has THE RELATIVES changed your approach to the relatives you’ve uncovered? 3. Gwen and Mario have been married for over 22 years. Do you enjoy stories of mature love, or do you prefer to see blossoming relationships? Why? 4. Are you a hospitable person like Gwen and Mario? Do you believe in the inherent goodness of others? Why or why not? How would you have dealt with relatives who used and abused you? 5. Did you underestimate Cecily’s intelligence the way Mario did? Have you ever done so in your life and regretted it? What was the situation, and what did you learn from the experience? 6. Which did you find more off-putting: Cecily’s passive-aggressive digs at Gwen and Mario or Landon’s complete passivity? Why? 7. What were your feelings when Cecily died? Did you see it as poetic justice? 8. After the ending of THE RELATIVES, do you think Landon gets away with the identity switch, or is he found in Canada and extradited to the US to stand trial for the three murders? Or, alternatively, do you think he got involved with another woman like Cecily who would abuse him as she did?